Drones get their share of negative press relating to privacy issues and military usage, but there’s far more to them than that. Drone Adventures, an association of volunteers, was founded three years ago to demonstrate that drones are perfect for humanitarian and nature conservation purposes too. 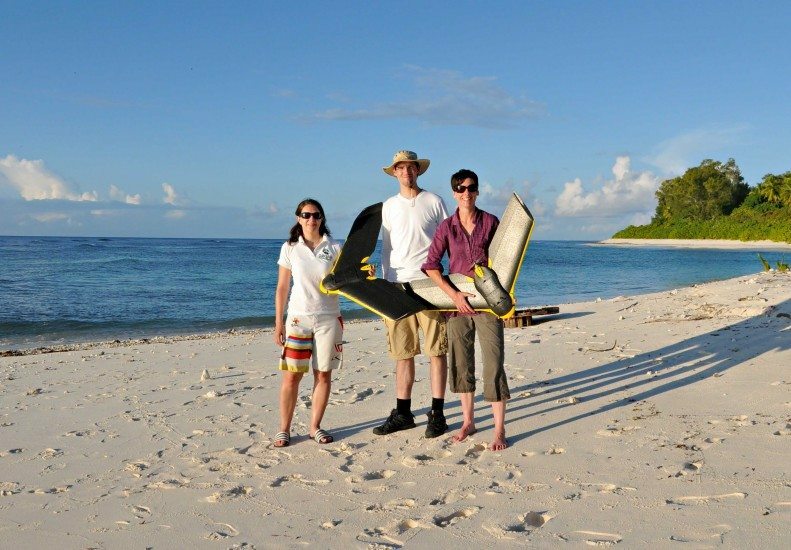 To prove the point, the Save Our Seas Foundation recruited Drone Adventures to help its researchers at D’Arros Island and St Joseph Atoll in the Seychelles. Surf washes across the reef on the fringes of St Joseph Atoll. By using drones to generate aerial maps, researchers will be able to better manage the area and track how it changes over time. Drones have become a major force in the civilian world over the past three years as people are becoming aware of more and more applications for them. The most obvious are aerial photography, mapping and surveillance, but there are many, many more. Just about any movie you see today has scenes that were filmed using drones; civil engineers worldwide get help from drones every day to produce maps and 3D models for their projects; and the future of merchandise transport has opened up, with drones being used to deliver parcels right to the consumer’s front door. But why is there all this hype about drones? Many reasons come to mind, the most important of which is probably that drones give us new perspectives and open up new possibilities – and all at a fraction of the cost of current technologies such as satellite imaging or photographs taken from manned aircraft. Drones, moreover, are easy to use, which makes them available to a large number of people with little or no specialist knowledge of operating them. In many areas of nature conservation drones can be a game changer. They enable researchers and conservationists to create quickly and cheaply their own high-resolution maps and 3D models that can then be used to analyse information and to answer questions relating to the environment. An example is our Savmap initiative, in which we developed a monitoring tool for sustainable land-use management and the conservation of rare species in Namibia’s semi-arid savanna. Drones are also an excellent tool for tracking poaching activities and acquiring imagery that enables researchers to analyse inaccessible areas and count animals. 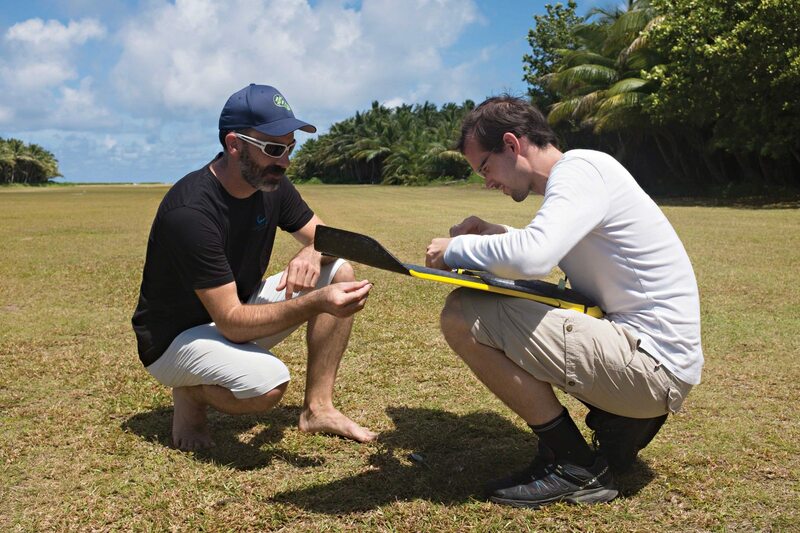 Dr Rainer von Brandis watches Alexandre Habersaat, software engineer at senseFly, as he launches the eBee mapping drone from the research boat at St Joseph Atoll. 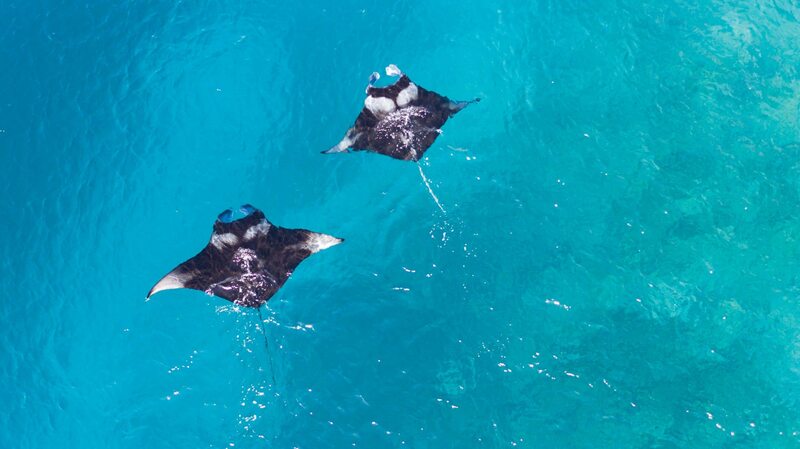 Until now, though, little use has been made of drones for marine conservation. Although their endurance, wind resistance and reliability have improved immeasurably over the past few years, the harsh environments and long distances that are integral to marine conservation have raised some serious challenges for drones. At Drone Adventures we are always open to trying something new and willing to push the boundaries of the ‘drones are good’ concept. 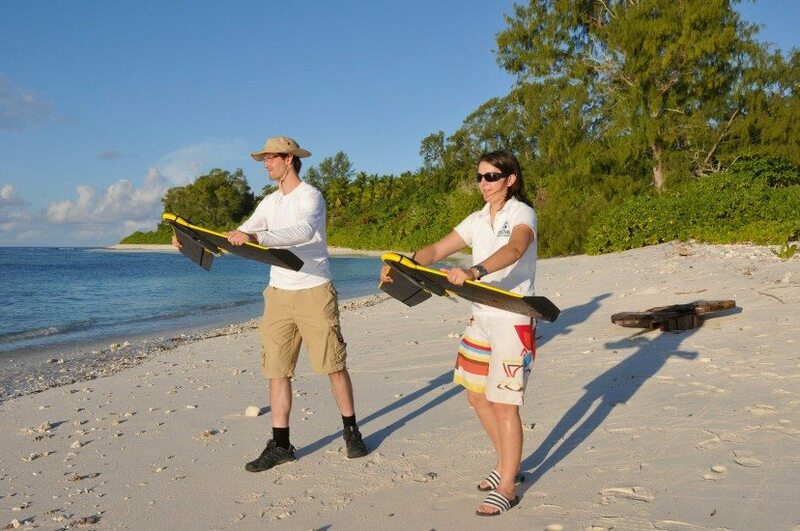 When Michael Scholl of the Save Our Seas Foundation (SOSF) asked if we were interested in mapping St Joseph Atoll in the Seychelles and collecting imagery for the research projects under way there, we were very curious to find out how drones could help marine conservation. In late November 2015 we packed up the equipment we needed for a week-long mission on site and prayed to the weather gods to be kind to us and our drones on this risky venture. 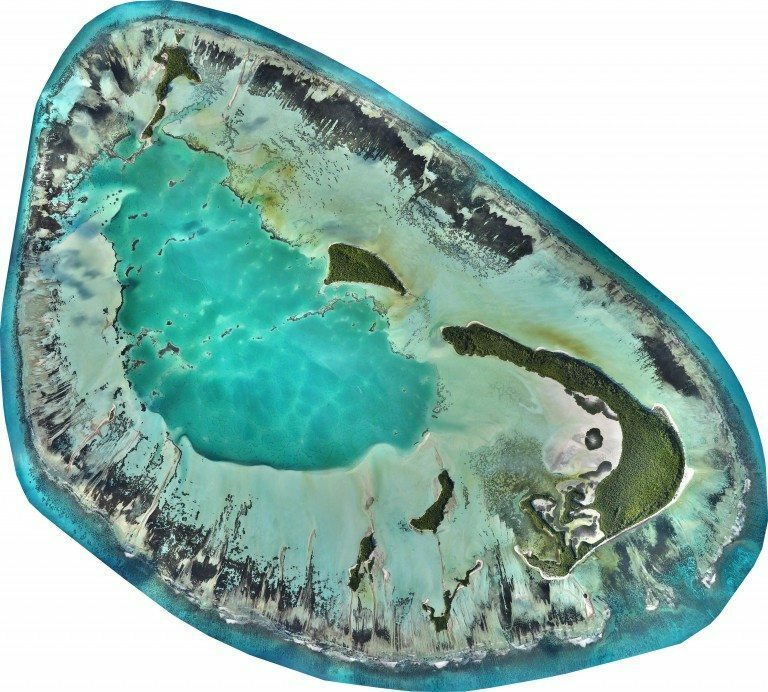 We needed all the help we could get to map the 25 square kilometres (10 square miles) of St Joseph Atoll and obtain aerial imagery from very low altitude that would reveal shark pups, rays and turtles in the shallow water below. Our main task was to create a high-resolution base map of the entire atoll, which is approximately eight kilometres (five miles) long and five kilometres (three miles) wide. Our four eBee drones, equipped with consumer-grade compact cameras, would have to obtain overlapping aerial images and we would then have to turn these images into a map, using Pix4Dmapper mapping software. But there are a number of challenges inherent in this undertaking. First of all, water reflects sunlight that interferes with the reconstruction process, so mapping water with aerial imagery by drone has been impossible until now. Secondly, to be able to reconstruct overlapping images, the features that the mapping software detects in order to create the map must be identical from one image to the next. Water, however, has no distinctive features and, with reflecting sunlight making the situation worse, the chances of reconstructing images into a map are close to zero. Featureless sand and dense forest are the next worst things to water when it comes to drone mapping. And, as you’ll have guessed, St Joseph is made up of water, sand and islands with dense forest! This is the main reason that so far few atolls, if any, have been mapped using drones. Sonja Betschart, expedition leader for Drone Adventures, checks the belly-mounted camera on the eBee mapping drone before launch. We reached D’Arros Island and its neighbour St Joseph Atoll by charter plane and as we flew in we were encouraged when we saw that the atoll was full of underwater features that could be distinctly seen in the shallow water. Full of optimism, we couldn’t wait to unpack our drones and give it a try, hoping that the images we obtained would capture as little sun reflection and as many underwater features as possible and thus give us a good chance of reconstructing the images into a map. As soon as we had landed on D’Arros, we attached the wings to one of our drones and sent it out. It returned with images of a small part of the atoll, which we processed overnight. To our great relief, we discovered the next morning that the images reconstructed perfectly into both a 3D model and a map. Now that the most important issue had been resolved, a series of other logistical challenges relating to flying our drones was waiting to be tackled. The first challenge was distance. Although drones are fantastic tools for taking aerial images in terms of cost, availability and ease of operation, their reach is limited compared to that of manned aircraft. The furthest point of St Joseph Atoll lies a good eight kilometres (five miles) from D’Arros, which is quite a stretch for radio communication and for a safe emergency landing and retrieval if necessary. The second challenge was take-off and landing. Even though our fixed-wing drones don’t need much space to get into the air and come down, they still require an open area free of trees and other obstacles for a smooth and safe take-off and landing. Like any other electronic devices, the drone and its camera are not fans of water or sudden shocks, nor of tree-tops (it’s difficult to retrieve them) or fine sand (it takes hours to clean sand from the camera shutter – hours that are better spent in the air). Stéphanie Cettou, customer support engineer at senseFly, watches the eBee drone ascend, having just launched it from the research boat. Weather was the third challenge. We can plan and prepare for many things, but ideal flying weather is not one of them. Our drones do not like too much wind (stronger than 10 metres per second) or rain, which interferes with the electronics and can result in an emergency landing – not ideal over open water. Both are frequent at St Joseph. We chose the end of November for our mission as weather statistics show that wind and rain are least likely at this time of year. And the weather gods rewarded us with a week of very gentle winds, or none at all, and very occasional rain that fell early in the morning. Our fourth challenge was the tide. Like the weather, the tide cycle was beyond our influence. We wanted to map the atoll at both high tide and low tide, so the windows for flying the drones and obtaining images were very small. To create a map with uniform lighting, colours and water level, our best chance was to map the atoll in a very short timeframe, which is why we took four drones so that we could fly them simultaneously and get the images needed in just over an hour. Our flight plans were prepared well ahead, but the challenge lay in flying the drones at the ideal moment: when the tide was just right, when there was little wind and no rain, and preferably not between 11am and 4pm, when there was too much reflection from the sun onto the water. We also had to make sure take-off was from a safe location and that we could maintain radio contact. Thanks to the good weather, we found these ideal moments twice, both during high and low tide, and were able to acquire close to 1,800 images each time. The images reconstructed perfectly into two maps with a resolution of 15 centimetres (six inches) each, which is about five times more precise than the best satellite map and 10 times better than the Google maps that the local research team had used to date for their daily work. The first analysis using the new maps, conducted by Dr Rainer von Brandis, the scientific director of the SOSF D’Arros Research Centre, enabled him to identify important changes in the shores and sand banks that couldn’t be seen on the Google maps and satellite imagery. 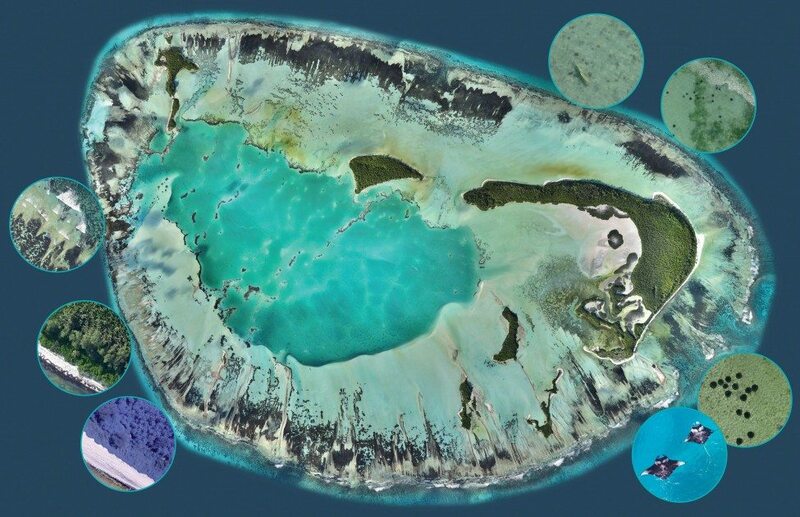 Further analysis will enable the scientists to establish details and features of the atoll environment, such as coral reefs, that have eluded them until now due to the low resolution of the maps they were using. In addition, as our maps are not just maps but georeferenced true orthomosaics, the D’Arros research team can now measure distances and features with an accuracy of up to 15 centimetres and locate any spot in the atoll with the same precision, two new possibilities that could be very useful for all future research work on site. Screengrab of Postflight Terra 3D | Pix4D software showing the complexity required to integrate and match thousands of images into a three dimentional model of St Joseph Atoll. Once all the images needed for the base map were in the bag – or crunching in our laptops to generate the maps – we were ready to move on to the next goal we had set ourselves: to fly our drones at very low altitude, 50 metres (165 feet) or lower, to obtain aerial images for transects and species analysis. Just the idea of capturing images of shark pups smaller than 20 centimetres (eight inches) long was motivation enough to overcome our fear that flying so low over water and up to seven kilometres (four miles) from the nearest take-off and landing site would be very risky. The areas and transect lines established for these flights matched up with the exact locations of previous transects done by boat and species counts carried out on foot in the shallow water. Although the D’Arros researchers were interested mainly in getting photographs of shark pups (blacktip, whitetip and lemon sharks) and juvenile stingrays, they were also keen to obtain close-up, high-resolution aerial imagery of the coral reefs, as well as any other species that could be identified. A first series of flights at approximately 50 metres above sea level enabled us to get about a thousand images at a resolution of two centimetres (0.8 inch) per pixel. Quickly looking through the images, the D’Arros researchers could already identify various species, including shark pups, and the resolution was good enough for them to identify and count the different ray species in the shallow waters along St Joseph’s beaches, to determine the structure of the coral reefs around D’Arros and to see turtles and shark pups. However, to identify accurately the species of the shark pups and to measure their size with certainty, a better resolution was needed. As the flights at 50 metres went smoothly and the weather conditions were still ideal, we decided to get more images of the shallow pools where shark pups were abundant at high tide. At the same time we would double the resolution to one centimetre (0.4 inch) per pixel by halving the altitude to a very low 25 metres (82 feet) above water level. To be certain that this could be done without drowning one of our drones and that we could obtain images that were not blurred (due to being so close to the water surface and flying at a speed of about 50 kilometres, or 30 miles, per hour), we decided on a test flight launched and monitored from a boat in the middle of the atoll. This would enable us to keep a close eye on the drone and retrieve it in case wind conditions forced it to crash. Once again, everything went smoothly and the images were still clear enough for analysis. So we waited for the next high tide the following day and sent the four drones off to fly over the designated areas, clicking away without the shark pups, juvenile rays and turtles imagining that their photographs were being taken just above them. 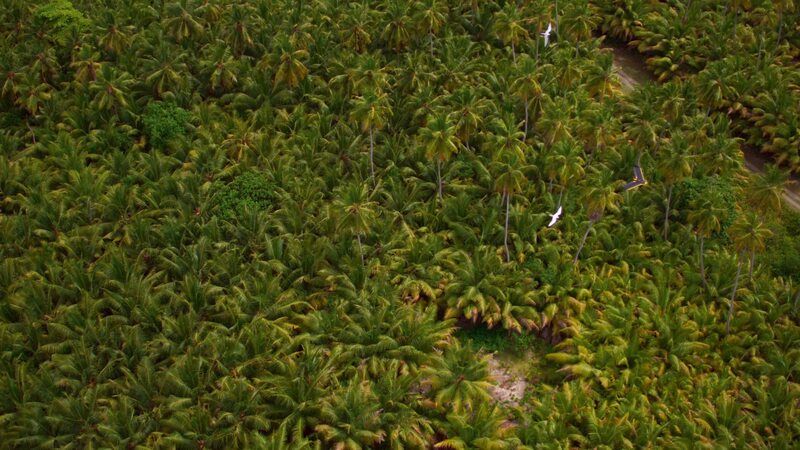 The eBee drone soars above a coconut forest on D'Arros Island and is followed closely by birds that seem to be captivated by this strange black and yellow bird that has been flying over the islands for the past few days. 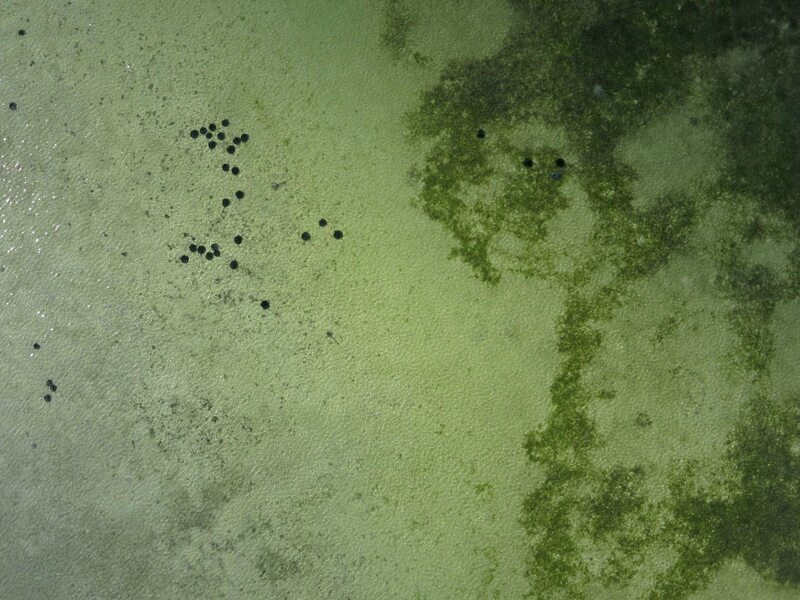 Compared to traditional transects and counts done by boat or on foot, the use of drones brings the important advantage of not interfering with the species’ habitat. Counts done with drone imagery are much more reliable in terms of natural conditions in a specific habitat and are more accurate, as each individual is counted only once and all individuals can be seen over a large area. The lower flying altitude enabled the researchers to identify the shark pups correctly. By zooming in on the image, they could also measure the pups’ length very precisely, as one pixel corresponded to one centimetre. All the images obtained have been left with the D’Arros researchers, who will now sit at their computer screens identifying, counting, measuring and geo-referencing the many shark pups, rays and turtles photographed. We had some flying time left and, as we are always keen to operate the drones at all times of day and night to gather new information, we asked the researchers to give us some additional challenges. One was to identify the health of trees on one of the islands in the atoll. The scientists had realised that, over time, they were seeing more and more dead or dying trees as they cruised past the island in their boats. They surmise that the rising sea level is pushing salt water into the island’s ground water, but the vegetation is so dense that they couldn’t make out the extent of the dying trees on the island as a whole. Having equipped one of our drones with a near-infrared camera, we used it to photograph the complete island and then converted the images into not only a map, but also a vegetation index. This index, known as a Normalised Difference Vegetation Index (NDVI), is a simple indicator that can be used to analyse a patch of vegetation and assess whether any of it is living and green. A first quick analysis showed that trees are dying off or are under heavy stress not only at the shoreline, as spotted from the boats, but even more extensively in the island’s interior. This high-resolution map is a composite of thousands of images captured with drones flying simultaneously. The software ensures that any moving objects are discarded, but the circular images show some of the fauna and flora that was recorded during low-altitude flights. By repeatedly producing NDVIs of the same area every six or 12 months, it is possible to measure to what extent – and how quickly – trees are dying. Without drones, such an analysis would be possible only by using manned aircraft. The expense of such an exercise would be too high to make it feasible. In other words, the use of drones enables researchers themselves to produce meaningful data much more quickly and cheaply. This in turn leads to greater understanding about species and their habitats and the ability to communicate new insights that can stimulate more positive conservation action. 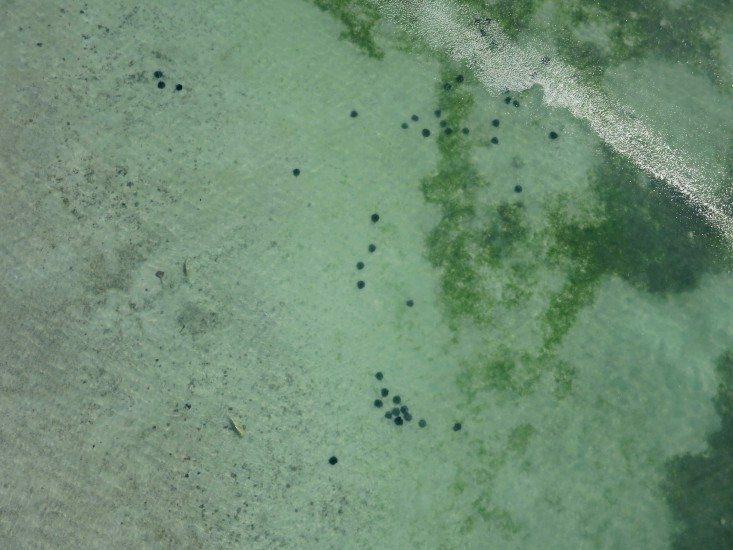 Another challenge the researchers came up with was to find turtle nests using drones and thermal cameras. The chances for success were slim, but it was certainly worth a try. We equipped one of our eBee drones with a thermal camera and flew it along the shoreline of D’Arros in an attempt to obtain thermal imaging of the beaches all around the island. It is well known that turtles visit this shore at night to lay their eggs and that there is a lot of nesting activity. We decided to send the drone out at 5 am as this is when it is likely to be coolest on D’Arros, although on this particular morning the temperature was already 28 °C at that time. After our first night flight on D’Arros, we very excited as we scanned quickly through more than 5,000 thermal images on our laptop – and were disappointed, but not surprised, to find no colour in the image, and therefore no temperature difference on the sandy beaches. 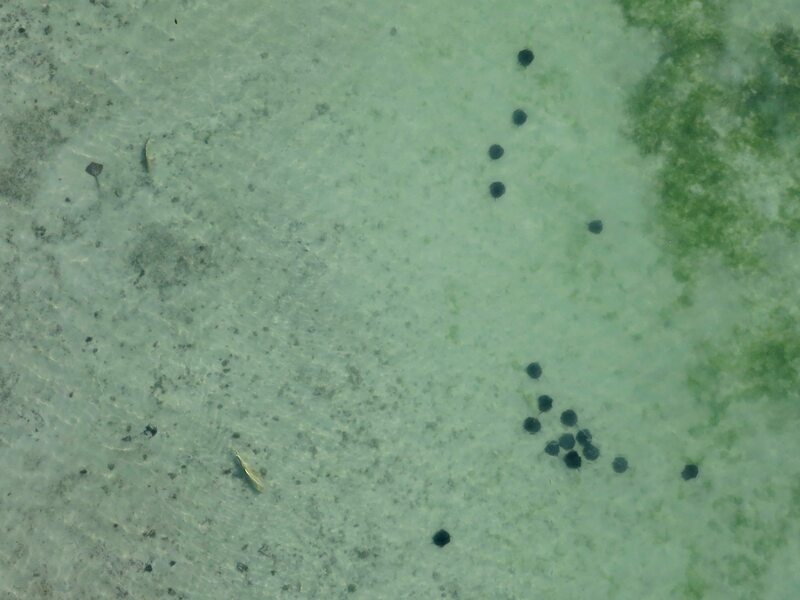 This failure to produce meaningful data was due to two factors: first, the very small difference between the ambient temperature (28 °C) and the temperature of the turtle eggs (reportedly 26–32 °C); and, possibly more importantly, the depth (about 50 centimetres, or 20 inches) at which the eggs are buried in the sand, often hidden under bushes. Nevertheless, it was worth the try. We did at least discover at what point nature defeats even the latest technology. And, with the many other useful results achieved during the week, our efforts overall shed more light on how drone imagery can help marine conservation. National Geographic Magazine: In the Seychelles, Taking Aim at Nature’s Bullies – Restoration efforts are giving vulnerable native species a second chance on islands in the Indian Ocean. 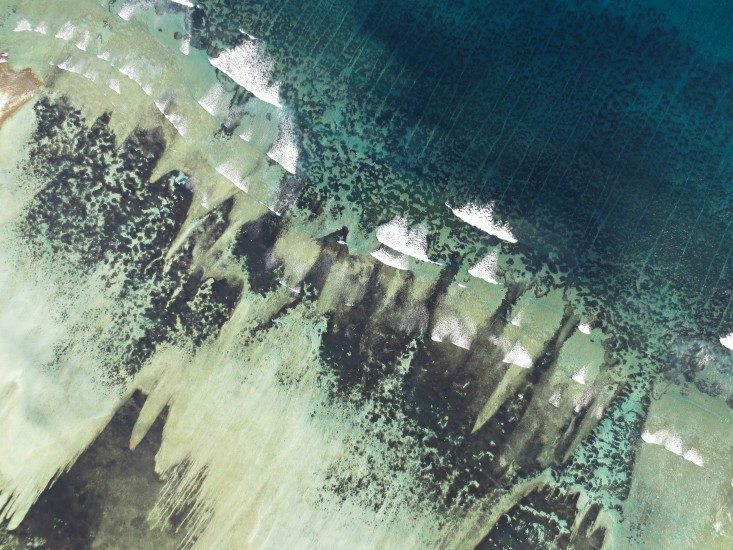 Single image from the senseFly eBee drone during the mapping of the St Joseph Atoll showing the reef structure. Single image from the senseFly eBee drone during the mapping of the St Joseph Atoll showing the island structure. Single image from the senseFly eBee drone during the mapping of the St Joseph Atoll showing aggregations of stingrays in the atoll. Single image from the senseFly eBee drone during the mapping of the St Joseph Atoll showing aggregations of stingrays and juvenile sharks in the atoll. Combined, D’Arros and St Joseph share a coral reef area of almost 2,000 hectares. This pristine ecosystem provides critical habitat for hundreds of species on land and in the ocean. A wide variety of drones is available to bring new perspectives and opportunities to research and nature conservation today. At D’Arros and St Joseph we used senseFly’s eBee drones, a fixed-wing craft that weighs only 700 grams and ensures that flights are easy to plan. It is fully automatic when executing a mapping flight, which gives best results, complete control and great safety. Fixed-wing drones are ideal for mapping large areas and covering long distances, but they are more sensitive to wind and always fly at a constant speed. They were certainly the best choice for the results we were looking for at D’Arros and St Joseph. Copters – either quadcopters or octocopters – are better for spotting a certain type of animal while getting still or video imagery. They come into their own for spotting sharks and whales close to shore or, as happened at D’Arros, for easily finding, filming and photographing manta rays that were feeding just off the beach. Choosing the right kind of drone to fit the mission at hand, weather conditions and the distances to be covered not only guarantees the best results, but also reduces expenses and the risk of, for example, a drone sinking to the bottom of the ocean. 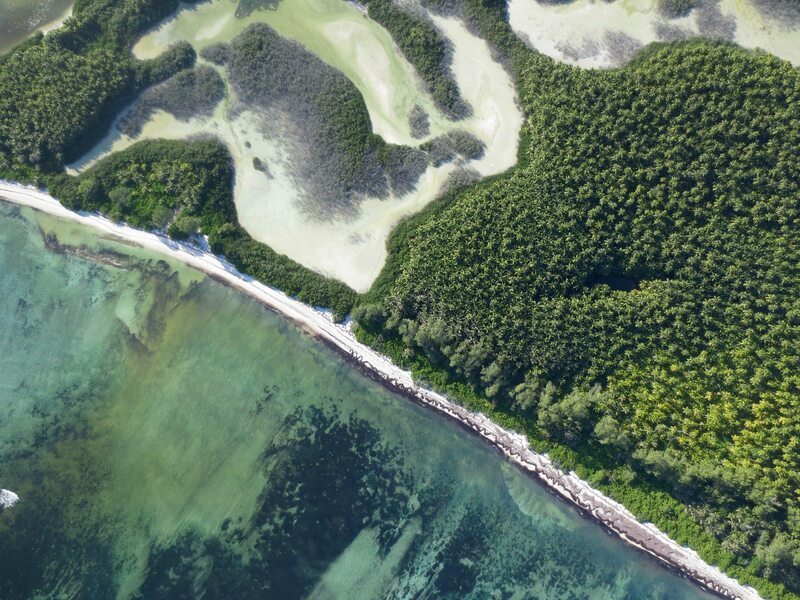 This first marine conservation mission enabled us to test out various applications for drones and produce several baselines for the researchers: a high-resolution map of the complete atoll, vegetation indexes for two islands and aerial imagery at very high resolution to establish undisturbed animal counts for transect and specific research areas. Two of the most important advantages of drone mapping technology are its low cost and the ease of use for just about anyone, both of which allow the same flights to be repeated easily. In addition, the data obtained are converted effortlessly into maps, 3D models or indexes that enable the researchers to analyse accurately the current environment and the changes that occur. Because the results are always very visual (as demonstrated by the stunning map of St Joseph Atoll), they are excellent for communication and in presentations. Drones are also valuable tools for shark spotters in their daily work. As the technology for both drones and cameras improves, more and more possible applications will be added in the coming months and years. As for us, we are extremely happy that we could provide answers to questions such as ‘Can an atoll be mapped using drones?’ or ‘Is drone imagery good enough for research in the marine environment?’. So when you ask ‘What’s next?’ my answer will be ‘Bimini!’ or ‘D’Arros in November 2016!’ Above all, we want to keep on pushing the boundaries of using drones for marine conservation – and keep on having fun while we do it. 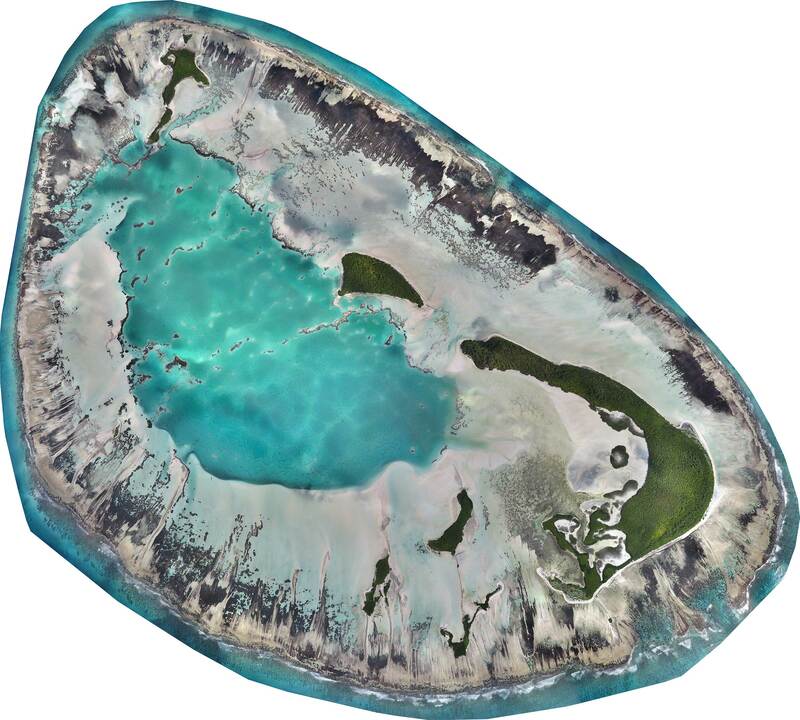 Please check out the interactive high resolution images of the St Joseph Atoll at low and high tide. This high-resolution map is a composite of thousands of images captured with drones flying simultaneously. The St Joseph Atoll at low tide. This high-resolution map is a composite of thousands of images captured with drones flying simultaneously. The St Joseph Atoll at high tide. The Save Our Seas Foundation (SOSF) collaborated with Drone Adventures in November 2015 to map the St Joseph Atoll adjacent to D'Arros Island in the Amirantes, Seychelles. The resulting high resolution (15cm) map at low- and high-tide present a very useful tool for the different research projects undertaken at the SOSF D'Arros Research Centre, and baseline map to study the evolution of the local ecosystem over time. The ultra-high resolution (1cm) transects conducted across the Atoll allow for population studies for juvenile Sharks, Stingrays and Turtles. 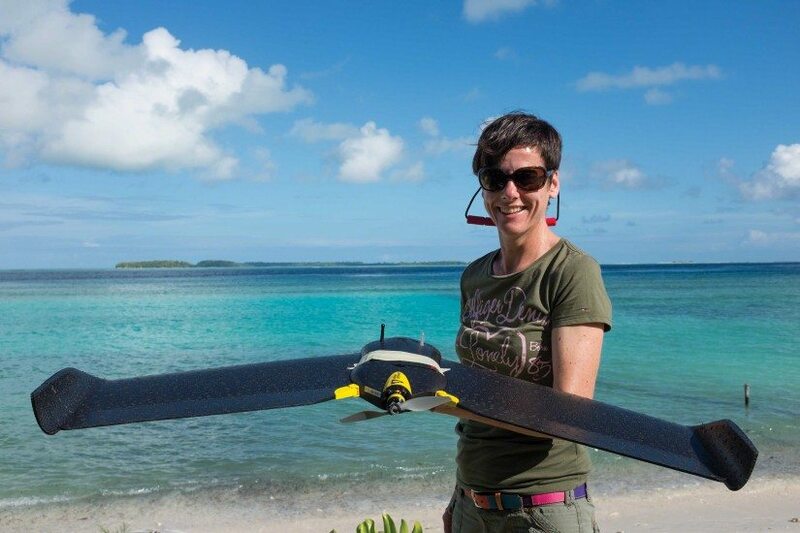 This expedition represents the first ever use of drones to map a marine ecosystem, and open the door for important conservation work using drones.